*I received a free copy of this book in return for an honest review. The perfect book for the armchair traveler. See Italy without leaving home. Jessa goes on a school trip to Italy in Instructions for a Broken Heart. What should be the trip of a lifetime is horribly marred just before Jessa leaves. She catches her boyfriend making out with another girl. Worse yet, both the ex-boyfriend and the new girl are on the trip to Italy with Jessa. To break her out of her misery, Jessa's best friend sends along twenty reasons that Jessa is better off without Sean along with twenty (often vengeful) things that Jessa needs to do to get over him. Instructions for a Broken Heart is as much a journey of break-up recovery as it is through Italy.. Jessa is lost in her anger, humiliation, and grief throughout the book. She slowly comes out of her shell either because of or in spite of her friend's instructions. A lot of Jessa's antics were hilarious. Stuff you always wish you'd done to an ex but never had the courage. Jessa doesn't have the courage either, but a mixture of anger and obligation toward her friend make her do some crazy things. Add to Jessa's heartbreak a young and cool teacher who sympathizes with Jessa a bit too much, another school group who seems to care nothing about Italian culture, a nice guy named Dylan Thomas (like the poet), and an interesting (although not really a big part of the story) Italian guy, and you have a strong set of subplots that break up the monotony of Jessa's moping. The book also does a great job describing Italian scenery, major landmarks, and art. I was uber-jealous of Jessa. The book isn't exactly fast-paced. It's always moving - everything that happens to Jessa is important for plot development, but it happens slowly. Perhaps because I read this book on a car trip that lasted 2 hours long than I expected (Augusta, Georgia is a long ways from Hilton Head Island, South Carolina), this book felt like the school trip that would never end. Don't let that scare you away from the book though. It's quite enjoyable - just realize going in that it's slow-paced. Jessa's grief and anger is so consuming that she is sometimes hard to like. There's only so much time you can bear being around a jilted girlfriend. But I got enough of an idea of who she normally is to think that I'd like her. She's extremely driven, a perfectionist, kind, and very smart. I love that she appreciated Italian culture. And her passion for Broadway musicals. She also grew a great deal throughout this book - learning that while Sean was a cheating jerk, she may not have been the best girlfriend either. The side characters were all interesting. I felt they functioned more as teachers for Jessa - helping her understand an element of herself - than characters of their own right. 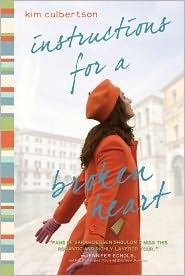 Instructions for a Broken Heart is a great book for anyone who loves Italy and who likes stories where characters go from rock bottom to standing tall again. It's a little slow, but consistently interesting. stopping by for my daily book review reading,this sounds ok. happy reading!! I just ordered this book so I can't wait to read it. I have read some great reviews on it. Thanks for the review! "and you have a strong set of subplots that break up the monotony of Jessa's moping." What a great way to put that! I'm glad her self-pitying episodes are interspersed with other events so we never get too weighed down with her melancholy. Fantastic review Alison! I have been wondering what this book would be like. Reading the description it certainly sounds like it has the potential to be a fun read. Just about to read this one. Glad to know about the slow pace. Sounds like it should be fun. Thanks for the review!